This HS-CB101/105 chilled beam sensor has been specifically designed to prevent the formation of condensation in critical applications. These low cost devices are comprised of microcontrollers, surface humidity and temperature sensing elements allowing the accurate calculation of surface conditions indicating the formation of condensation. A dry contact or VmA output will provide early indication of the condensation. The detector can also be connected directly to Spartan Peripheral Devices control valves as a condensation limit. The EF actuator utilizes rugged components in a pressure cast aluminum housing for added strength and reliability. It offers a high torque output of 270 in-lbs and a NEMA 4 option to meet tough environmental conditions found in many HVAC applications. The EF actuator was developed to satisfy high torque applications with a single actuator.The EF can take the place of two classic AF actuators in a piggy-back mounted application; simplifying wiring and mounting requirements while reducing material and installation costs.The NEMA 4 protection feature allows complete access to change the direction of rotation and allows locking or manually overriding the actuator. The EF offers easy installation, commissioning and connects to high torque applications with a complete line of accessories. Dual EF mounting on a single shaft is possible for higher torque. The EF series spring return actuators are available in basic models offering 24 or 120 VAC and faster run times with MFT models. NEMA 4 versions come with integrated junction box providing faster and easier installation. MFT versions provide the flexibility to program the actuator in the field for various proportional control functions and DC voltage feedback signals. DENT Instruments, a global leader in the design and manufacture of power and energy measurement instruments, announced the introduction of the ELITEpro SP recording power meter. The ELITEpro SP adds many new high performance features to its highly popular portable metering product line. The ELITEpro series products have earned a solid reputation among energy professionals as a versatile, dependable, and easy-to-use energy datalogger for single and three phase electrical metering projects. The ELITEpro SP requires no external power and can work on voltage services ranging from 80-600V. DENT’s patented PhaseChek™ circuitry includes a 3 LED indicator display that confirms proper CT to phase installation – greatly reducing set-up time. The ELITEpro SP features an 8MB non-volatile memory for extended recording sessions and user-defined recording intervals as short as every second. The ELITEpro SP™ can be mounted anywhere with its magnetic back and is small enough to be secured inside the electrical panel. IEC 61499 is the standard for distributed control systems that follows on from the IEC 61131 standard for programmable logic controllers (PLC). This book is a practical guide for component-based development of distributed embedded and control systems as proposed by this international standard. Each chapter is designed as an independent study unit, making the book ideal for use in university courses, industrial training, or self-study. Working knowledge of the IEC 61499 standard can be achieved in approximately 10 to 15 learning hours. For the control, automation, or software engineer and the embedded systems developer, this book provides concrete directions on how to specify and implement a distributed system according to the IEC 61499 standard and how to create an IEC 61499-compliant control device. The text also sheds some light on the broader embedded systems arena since the IEC 61499 standard provides the higher level (yet executable!) abstraction appropriate for model-based engineering of distributed embedded systems. Tasseron Sensors and Controls in Williamsport Pennsylvania is proud to introduce the Qwik Mini Duct Temperature Sensor. The Qwik Mini recently won honorable mention in the 2011 Dealer Design Awards in the Ventilation category. The Qwik Mini is not only the smallest duct temperature sensor on the market, but it installs faster than any other similar sensor. With its patented Qwik Connect technology, installing the Qwik Mini is a snap, literally. Simply install your wires into the spring loaded clips, snap on the tool-less cover, and your done. In testing against other similar products that utilize wire nuts, the Qwik Mini saves 2 to 3 minutes per sensor. The Qwik Mini comes with a standard 5 year warranty, and comes in a variety of NTC thermistors, and RTD’s. It comes in probe lengths ranging from 4” to 18”. Innotech Control Systems are proud to announce the release of the innTOUCH ISS01 to ISS04 Smart Sensor range. innTOUCH is a Smart Sensor solution for standalone applications or complete networked BMS solutions. The flexibility of innTOUCH ensures this Smart Sensor is suited to a wide range of applications including: Hotel Room Air-Conditioning; Commercial Air-Conditioning; High End Residential Air-Conditioning; VAV Zone Control; Custom configurations. The innTOUCH Smart Sensor used in conjunction with the powerful MAXIM Series of controllers enhances the MAXIM capabilities, allowing for custom configurations to accommodate individual client needs, including energy management and CO2 monitoring. Wireless Sensors today introduced its Rack Sentry family of environmental monitors at the Data Center World Conference in Orlando Florida. The all new family expands the SensiNet product line with features developed specifically for the needs of Data Center operations and includes tethered humidity sensors for in rack measurement and multipoint nodes for determination of temperature gradients. These new designs allow for granular measurements within racks, under floor grates, in return plenums and other strategic locations without the complexity of wiring. The ease of installation and reliability of the field proven SensiNet wireless network allows users to quickly deploy sensors with minimal IT footprint and no security exposure. The SensiNet wireless strategy also allows rapid redeployment to explore hot spots and qualify adds, moves and changes and is especially useful in determining compliance with ASHRAE TC9.9 2011 Thermal Guidelines for Data Processing Environments. 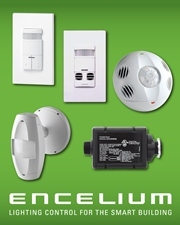 Encelium Technologies, a leading technology development company specializing in integrated lighting control systems for commercial buildings, has introduced its new family of low-voltage occupancy sensors. This product line includes a full range of passive infrared (PIR) and dual technology (Ultrasonic/PIR) low-voltage sensors available in both wall mount and ceiling mount configurations. E+E Elektronik has added an additional passive temperature measurement function to the tried-and-tested EE85 CO2 transmitter for precise measurement of CO2 concentrations and temperatures in HVAC applications. CO2 and temperature measurement in a single device cuts installation costs for sensors. The combined CO2 temperature transmitter is ideally suited for applications in the fields of building management and demand controlled ventilation. The elegant, compact housing enables easy installation directly at the ventilation duct using a mounting flange. - RobustelGoFixed W800 Plus 3G HSPA+ ADSL WiFi VoIP Gateway is a Dual-WAN 3G / ADSL2+ (VPN) firewall router integrated 3G HSPA+, ADSL / ADSL2+, 802.11b/g/n and SIP VoIP / FoIP. - 3G HSPA+ with Rx diversity (DL/UL 21/5.76 Mbps),works as a backup WAN, functioning asan automatic fail-over when an ADSL2+ connection breaks down. - With one RJ-11 FXS interface, users could enjoy excellent VoIP and T.38 FoIP service over ADSL or 3G. - 3G ADSL Wireless Gateway also provides IPsec VPN and PPTP VPN, users can access corporate intranet andtransmit sensitive data betweenbranch offices and remote sites anytime and anyplace.